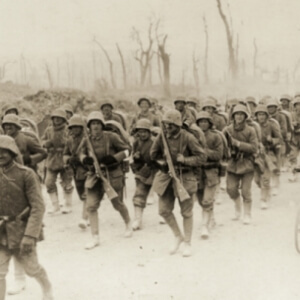 Called “The Great War” and more optimistically “The War to End All Wars,” World War I was an event that changed the world’s political map and the fabric of civilization. 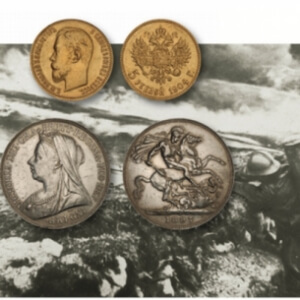 To honor the 100th anniversary of United States involvement in World War I, the Money Museum, operated by the American Numismatic Association (ANA) and located adjacent to Colorado College, is unveiling its newest exhibit: Trenches to Treaties: World War I in Remembrance. 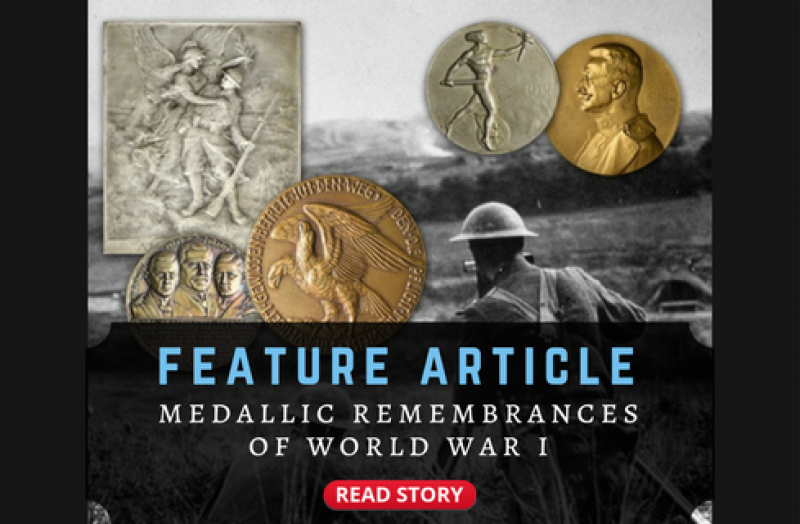 The exhibit showcases coins and paper money from combatant nations, art medals and military decorations, as well as weapons and uniforms to illustrate the events and effects of World War I politically, economically and socially. Trenches to Treaties: World War I in Remembrance runs through December 2018. 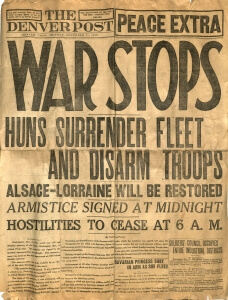 Click here to explore the WWI Virtual Exhibit. Notable artifacts on display include rare military decorations (awarded for heroism) such as the U.S. Congressional Medal of Honor and the French Croix de guerre; personal items soldiers carried in the field; dog tags, military badges and insignia; propaganda and satirical medals; plus a trench that replicates the front lines of battle. 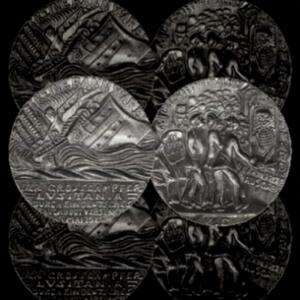 "Trenches to Treaties explores World War I with money and beautiful, thought-provoking medals. Themes range from finance, propaganda, art and commemoration,” said Money Museum Director and Curator Doug Mudd. “Exciting interactives include a life-size trench and operating morse code keys as used in trench communications. Come learn about the crash of the gold standard, merchant submarines and the role of pigeons!" Click the buttons below to navigate to the WWI Virtual Exhibit and other information on this page. More than 17 million people perished during WWI, and the unprecedented bloodshed was accompanied by social upheaval and revolution as ancient empires crumbled and new nations were established. The war grew to encompass nations from across the globe, with battlefields in Europe, Asia, Africa, the Pacific and most of the world’s seaways. Warfare was industrialized with horrific new weapons while propaganda campaigns ensured that civilians supported the war no matter what the cost. 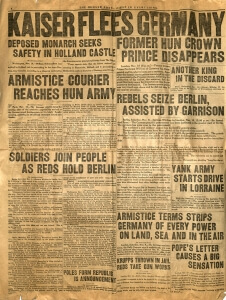 The entry of the United States into World War I in April of 1917 on the side of the Allies was decisive. American industry and agriculture ensured that Great Britain and France could continue to fight in spite of German successes, and American manpower eventually overpowered the German armies on the Western Front. Meanwhile, the U.S. replaced Britain as the world’s banker, becoming the greatest financial power on earth. 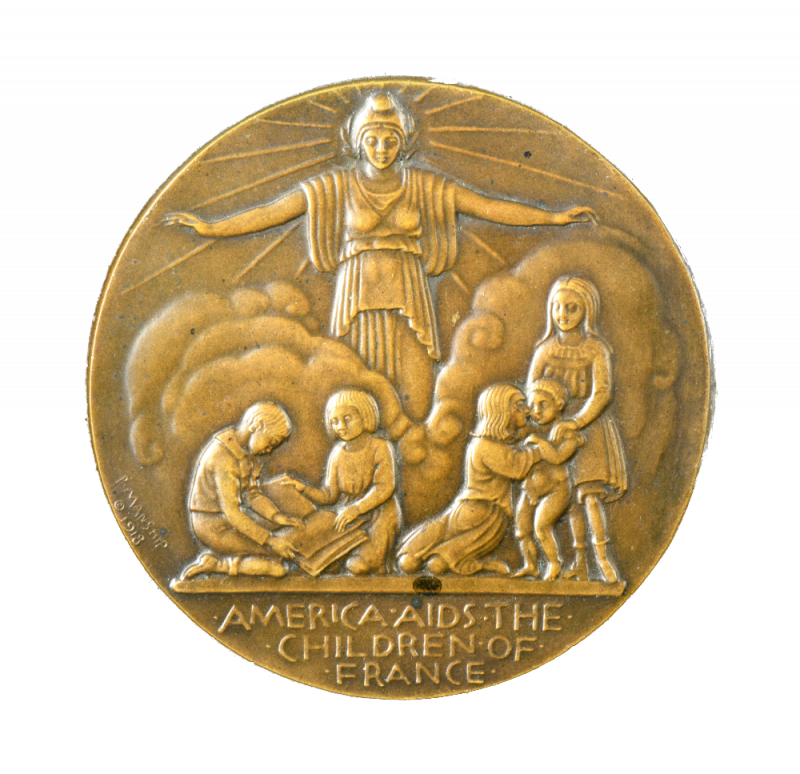 United States, American Red Cross medal, 1919, bronze, by Daniel Chester French. Obv: American doughboy facing left. 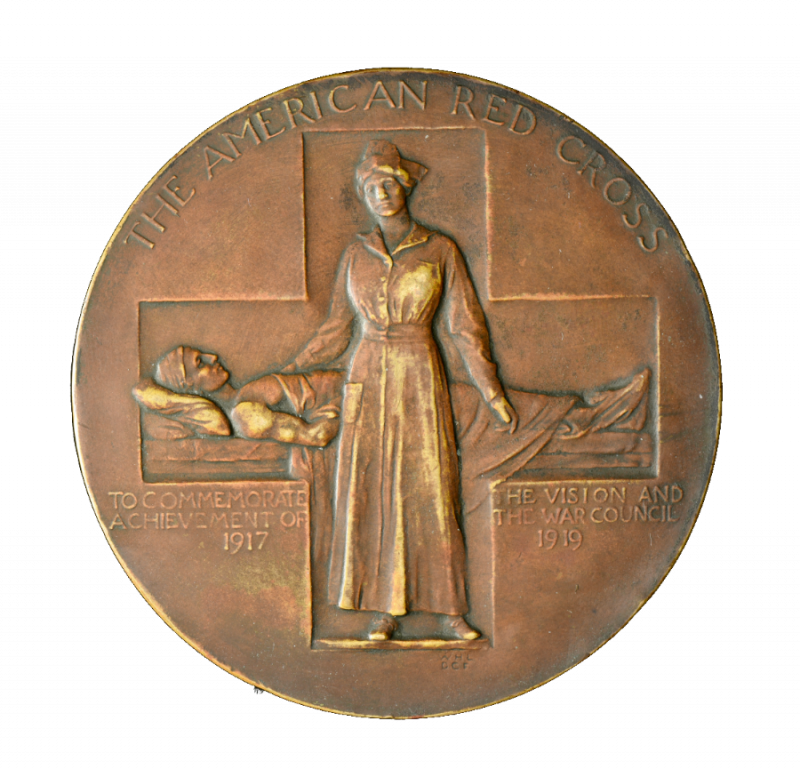 Rev: Nurse and patient inside Cross; THE AMERICAN RED CROSS / TO COMMEMORATE THE VISION AND / ACHIEVEMENT OF THE WAR COUNCIL / 1917 1919. 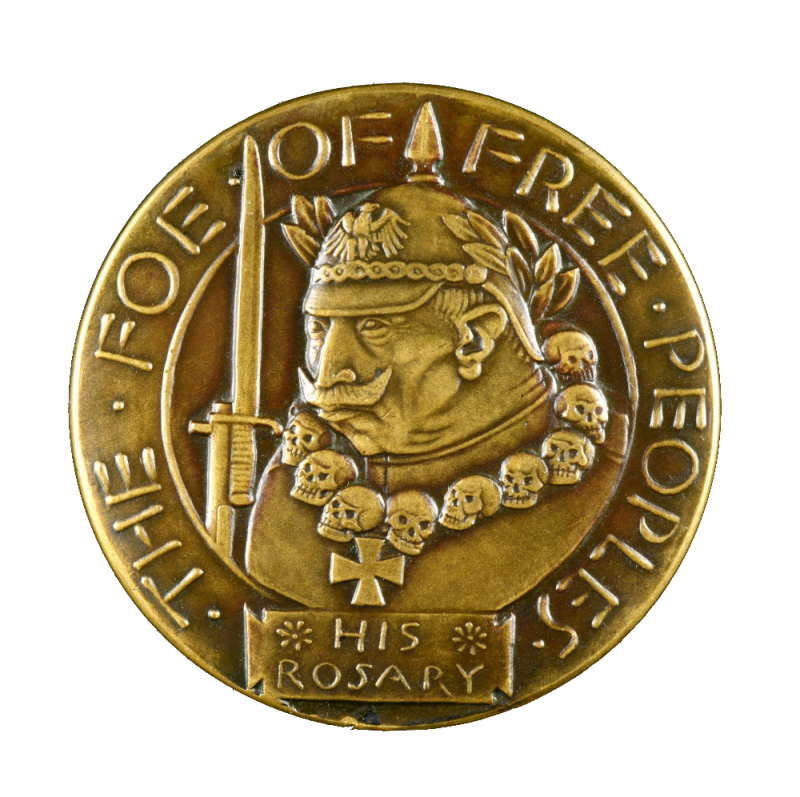 The Edward C. Rochette Money Museum’s World War I exhibit “Trenches to Treaties: World War I in Remembrance” features four medals from the ANA’s collection created by Paul Howard Manship (1885-1966). Perhaps the most influential American sculptor of the 1920s and 30s, he was best known for his influence on the Art Deco movement and presenting mythological themes in a classical style. 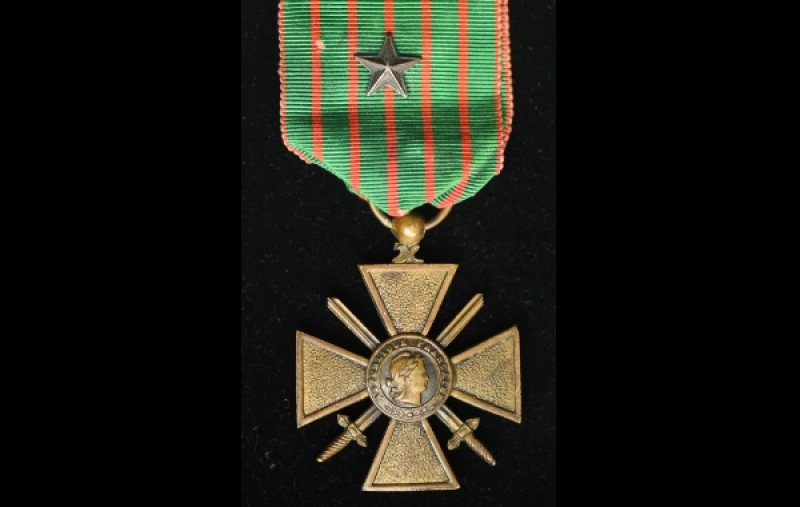 Manship produced several medals associated with WWI and was involved with the creation of other issues, including inaugural medals for John F. Kennedy and Franklin D. Roosevelt. However, numismatic contributions are only a small part of his artistic legacy. Born in St. Paul, Minn., he began honing his talent in sculpture after discovering as a child that he was color blind. Manship began his formal art education at the Saint Paul School of Art, followed by the Pennsylvania Academy of Fine Arts in Philadelphia. After winning the prestigious Rome Prize in 1909 Manship received a scholarship to the American Academy in Rome for three years, where he studied Greek, Roman, Egyptian, Asian and Assyrian art—all of which influenced his developing style. In 1912 he returned to America and immediately became successful, selling all 96 sculptures in his first New York show. Manship created more than 700 works during his career and served on a number of commissions and boards, including the National Academy of Design, the U.S. Commission of Fine Arts and the Smithsonian American Art Museum. His most famous works include Prometheus (1933) at Rockefeller Center, the Paul J. Rainey Memorial Gateway (1934) at the Bronx Zoo, and the Aero Memorial (1948) in Philadelphia’s Aviator Park – dedicated to aviators who died in World War I. The best-known of Manship’s World War I medals is the “Kultur” medal, created to memorialize Germany’s brutal conquest of Belgium in 1914. 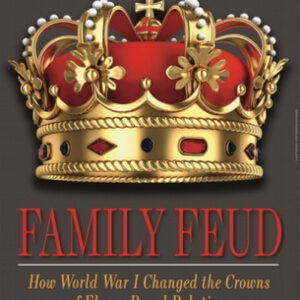 It features an image of Kaiser Wilhelm II (1859-1941) wearing a characteristic pickelhaube (spiked helmet) and a “rosary” of skulls, with a bayonet in the background. The legend reads THE·FOE·OF/FREE·PEOPLES. The reverse depicts a German soldier abducting a woman whose deceased baby lies abandoned on the ground. Medals by Manship on display in the World War I exhibit include an example of the “Kultur” medal; a Detroit Soldier’s Memorial medal for WWI veterans and given to the families of those killed in the war; a French Heroes Fund medal to raise money for French orphans; and an Art War Relief fundraising medal mounted on a wooden plaque. All of these works exemplify the artist’s mastery of Art Deco to depict classical themes. 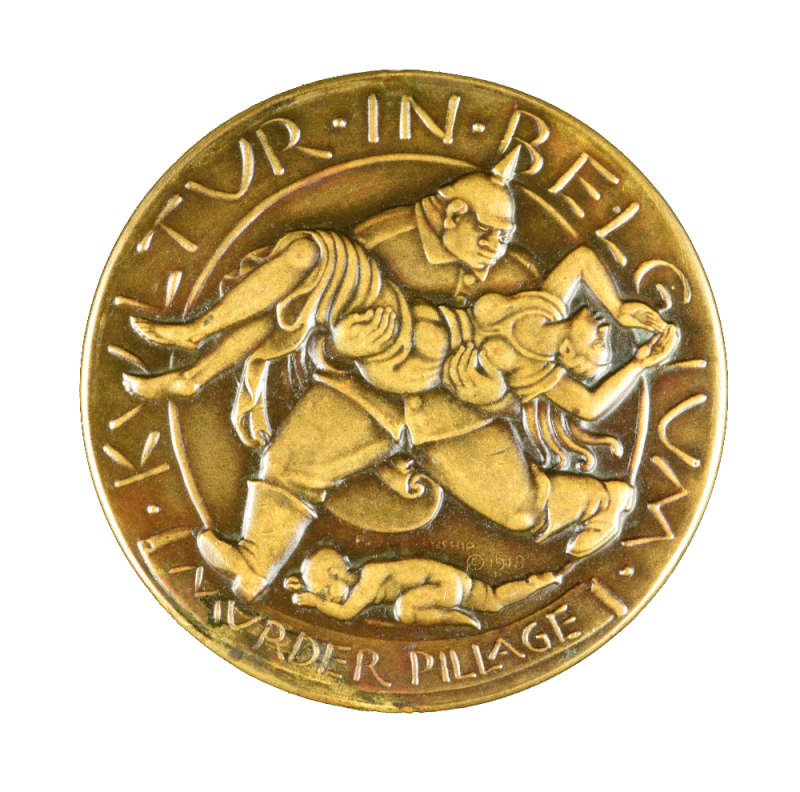 Kultur in Belgium satirical medal, 1918, bronze. Obv: Bust of Kaiser Wilhelm II with helmet and necklace of skulls, plaque below; HIS ROSARY / THE FOE OF FREE PEOPLES. Rev: Kaiser Wilhelm II carrying off female, child trampled and scroll below; KULTUR IN BELGIUM / MURDER PILLAGE / PAUL MANSHIP•1918. 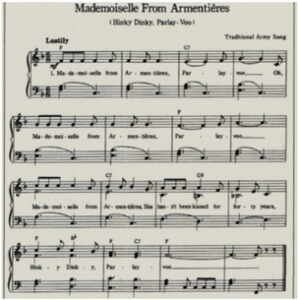 “Kultur” was an idealization of German civilization used by the German state to justify acts of Imperial aggression, especially prominent during both world wars. 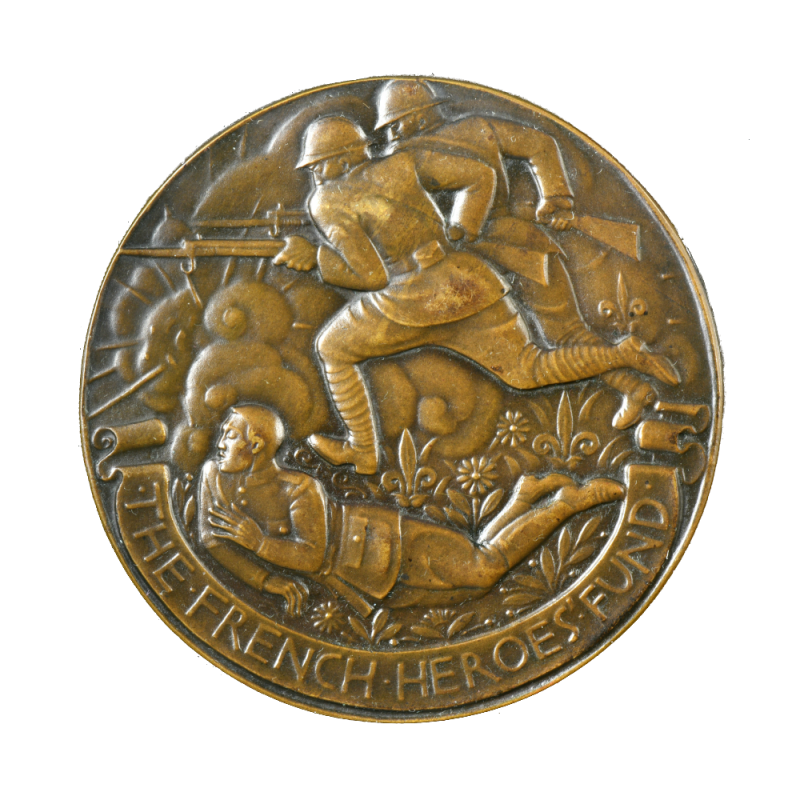 French Heroes Fund medal, 1918, bronze. Obv: Two soldiers advancing past a fallen comrade on smoke-filled battlefield strewn with wildflowers and fleurs-de-lis; THE FRENCH HEROES’ FUND. Rev: Allegorical figure America wearing the Phrygian cap and classical gown, watching over children; AMERICA•AIDS•THE / CHILDREN•OF / FRANCE•. The French Heroes Fund was established by Americans to help wounded French soldiers, their families, and children orphaned by the First World War. 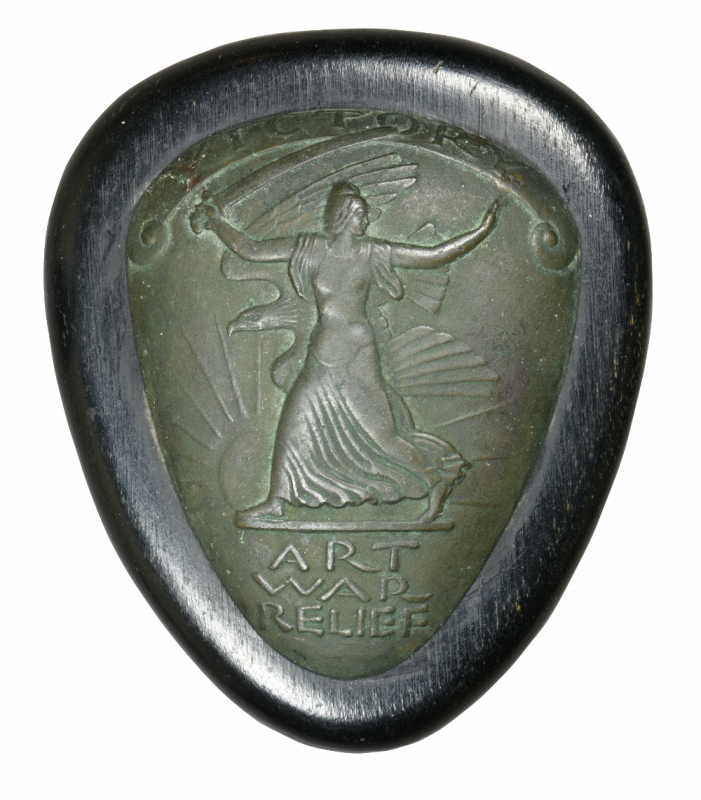 The reverse also symbolizes Marianne, France’s own “Lady Liberty,” who first appeared during the French Revolution. 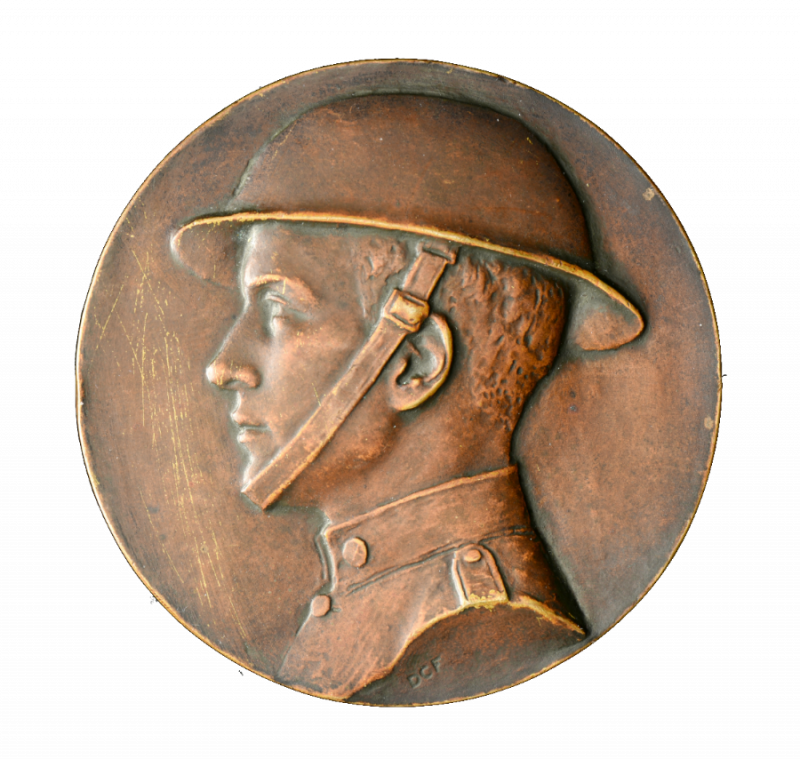 Art War Relief medal, 1918, bronze mounted wood plaque. Uniface: Victory walking left with sword, flying eagle and sun in background; VICTORY / ART / WAR / RELIEF. 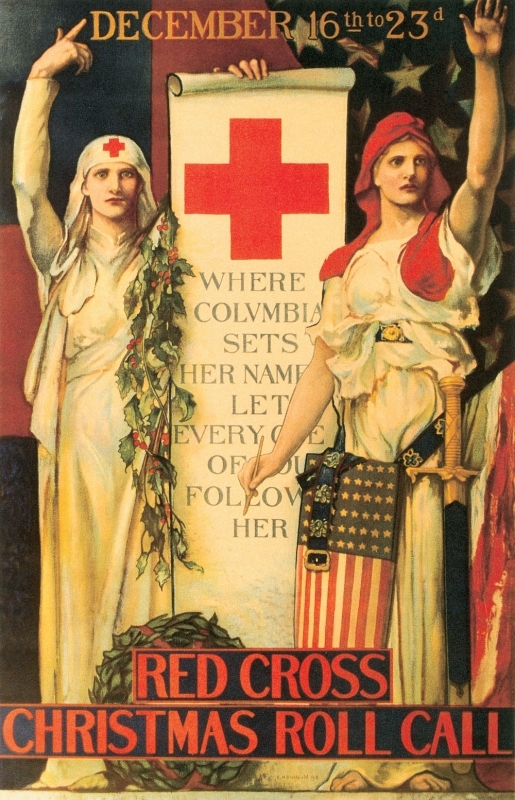 Art War Relief was an organization formed in 1917 when female members from a group of art societies formed a coalition in New York under the auspices of the American Red Cross . The group coordinated book drives, gathered clothing for refugee children in the Allied countries, and ran re-education programs for returning soldiers. 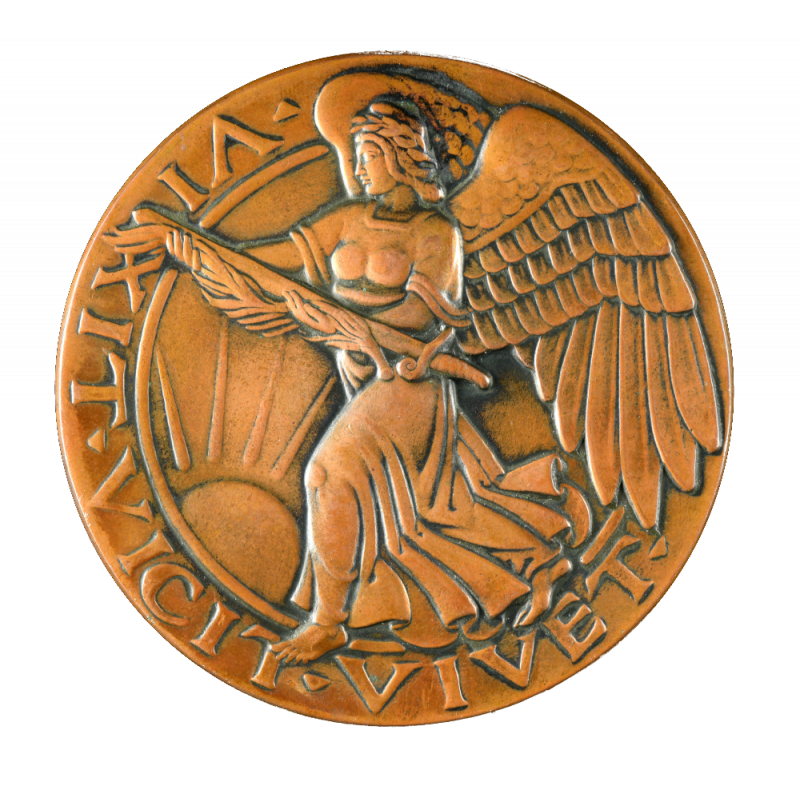 Detroit Soldiers medal, 1919, bronze. Obv : Winged angel of victory with sword and sun setting in background at center; VIXIT•VINCIT•VIVET•. 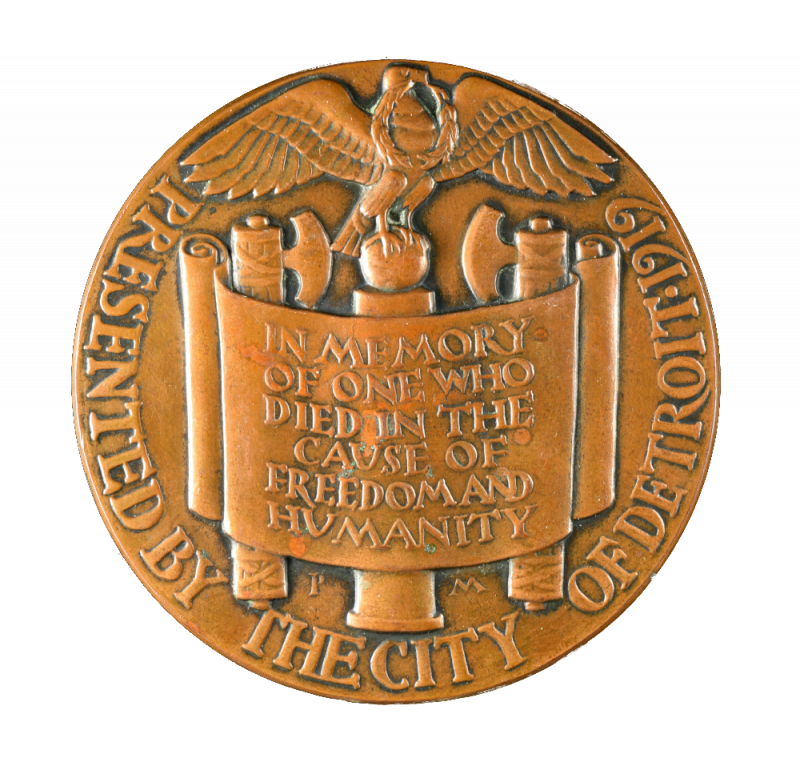 Rev : Scroll with eagle with laurel wreath in beak at top, two fasces behind; IN MEMORY / OF ONE WHO / DIED IN THE / CAUSE OF / FREEDOM AND / HUMANITY / (on border) PRESENTED BY THE CITY OF DETROIT•1919. This medal was commissioned by the Detroit Welcome Home Committee and given as “a token of sympathy and gratitude to the nearest of kin of those who gave their lives in the country’s service” during the Great War. This pamphlet was produced as a souvenir of appreciation given by the French people to American soldiers returning home after WWI. The introduction is written by Commander in Chief of Allied Forces Ferdinand Foch and conveys how much the presence of American soldiers meant to France. The pamphlet outlines the history of America’s entry into the war, its contributions and the battles in which U.S. forces participated, and includes sections describing the contributions of French women the other allies, and the material cost of the war. Click the right arrow on the slide player to advance through the pamphlet. You may also view the slides in full-screen mode by selecting the box to the left of the gear icon. 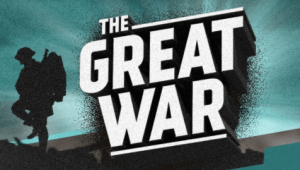 The Great War channel follows the events of World War 1 week by week as they occur 100 years ago. It includes an amazing amount of background information and incredible footage of the war. 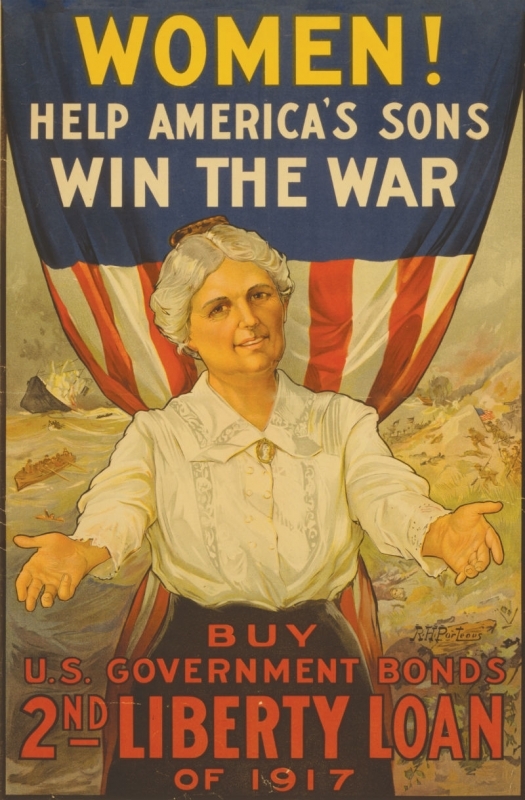 The Liberty Loans, (also known as Liberty Bonds), were issued between 1917-1919, and were used to finance America's participation in the First World War. Liberty Bonds were sold to banks, corporations, and to citizens. This was the first time in U.S. history whereby a substantial number of Americans would purchase bonds as both an investment and as a patriotic duty. 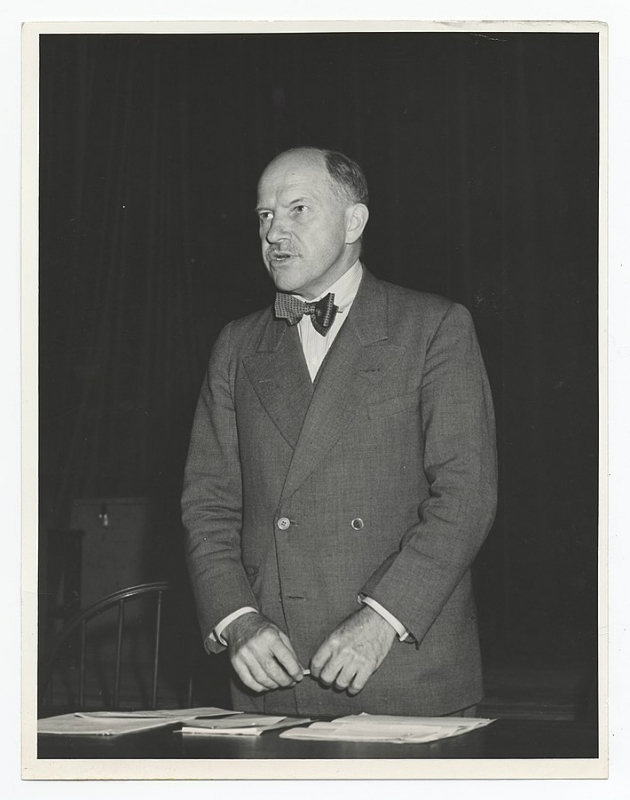 William Gibbs McAdoo, then Secretary of the Treasury, was responsible for creating the program, which raised some $21.4 billion over five bond issues: the First, Second, Third, and Fourth Liberty Loans, along with a Victory Bond. 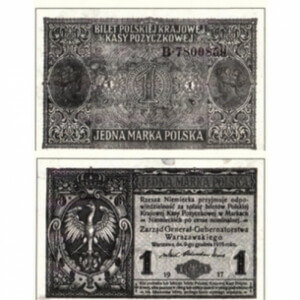 They were sold in denominations ranging from $50 to $100,000, both in bearer and registered formats. 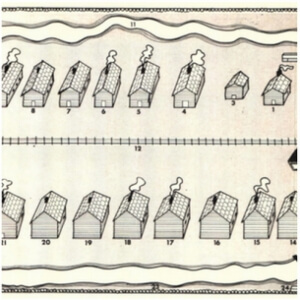 Some 66 million individual bonds were sold; today, fewer than 400 are known to exist, and all but seven examples are either $50 or $100 denominations. The Liberty Loans also represent the birth of modern debt issuance by the United States, and it is the Second Liberty Bond Act of 1917 that is the basis for the sale of Treasury bonds to this very day. 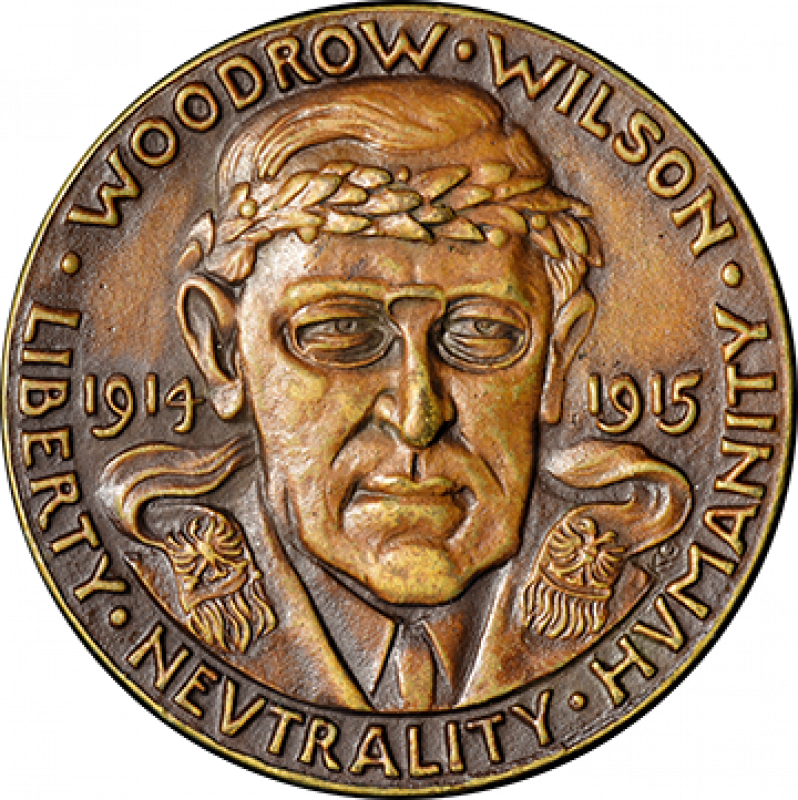 The Herbstman Collection has the most complete collection of Liberty Loans known, along with President Woodrow Wilson's 1913 cabinet appointment of William Gibbs McAdoo as Secretary of the Treasury. 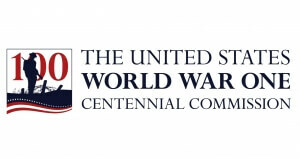 The World War I Centennial Commission was created by act of Congress in 2013 and has as its 5-year mission to serve as the leader in the U.S. for efforts to commemorate and memorialize WWI.